One in seven Americans is over age 65 and increasing rapidly. By 2030, 20% of the population will be over age 65. As our population ages, the incidents of elder abuse also referred to as elder maltreatment (abuse, neglect & exploitation) increase as well. Elder abuse is already significantly under-reported. Advocates believe that for every case of abuse that is reported, up to 23 cases go unreported. There are many reasons for the significant lack of reporting of elder abuse cases. However, difficulty in reporting should not be one. Unfortunately, in many states, there are barriers to reporting elder abuse. In many states, there is no single number to report an incident of abuse. And, it is difficult to find the current, correct number to report abuse. Often, even if there is a single number that covers an entire state, reports are only taken during certain hours of the day. Yet, those hours are not usually when friends or families are visiting elderly loved ones. When such barriers exist to reporting, it sends a message that reporting elder maltreatment is unimportant. Have ONE toll free telephone number for people to report abuse in that state. Florida is a good example of this with its 1-800-96-ABUSE (22873). While it may be good for government agencies to have several local offices available for consumers to visit. People who are attempting to report elder maltreatment, may be unable to take the time to search websites to determine the appropriate office in which the elder may be located and determine the correct number to call to make a report. The best practice would be to create a central number where all calls can be screened and then routed to the correct local office. A single toll free telephone number is also easier to educate the general public about than a system of regions or counties and corresponding telephone numbers. Make the elder abuse or maltreatment hotline available 24-hours a day, seven days a week, and on holidays. Many states make their abuse hotline available only during business hours, closing it for holidays. While most professionals may interact with elders during those hours, friends and families often spend time with elderly loved ones outside business hours and during the holidays. This is the time when friends, family, and the general public are more likely to observe signs of abuse, neglect or exploitation. T his is also the time when making a report may be most convenient because there are no distractions due to work duties. An abuse hotline available 24-hours a day removes many of the time and responsibility barriers that may interfere with family members, friends and the general public ability to make reports. The reporting number and information about reporting must be easy to find and see. The abuse reporting hotline number should be one of the first things consumers see on any website run by a state that provides services to elders, caregivers, or professionals that interact with elders. It is easy to create banner and column style ads with the reporting hotline information to run on every page of a website dedicated to serving elders. Basic information including a toll free telephone number and hours calls are taken should be prominently displayed. Make abuse hotline numbers visible everywhere. 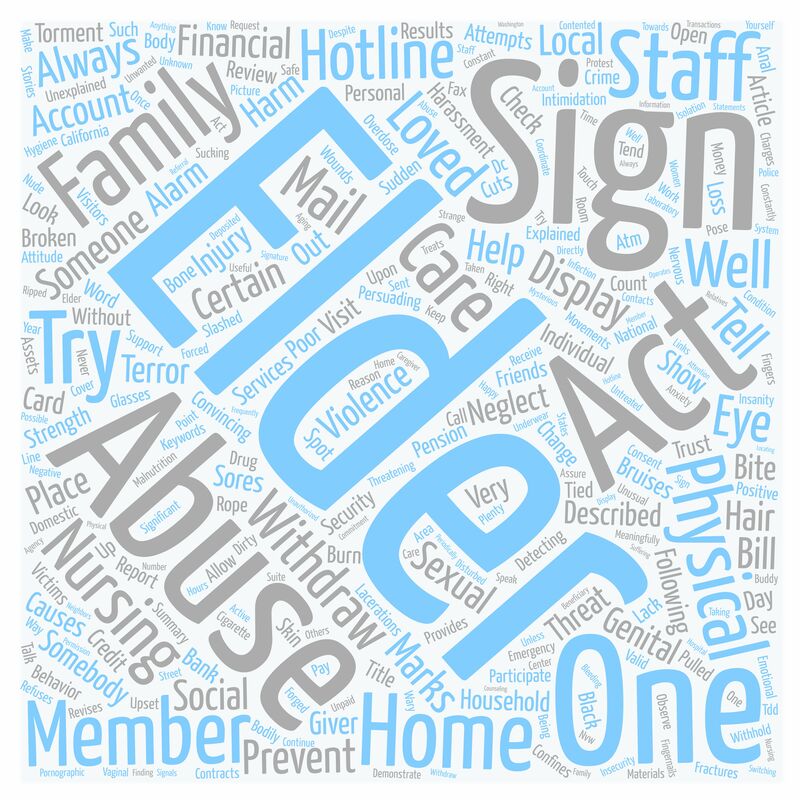 Assisted living facilities, care homes, group homes, hospitals, emergency rooms, intermediate care facilities, nursing homes, community health centers, senior centers, and urgent care centers should all prominently display the abuse reporting hotline so the general public and the professionals can see them. These numbers should also be displayed at post offices, public libraries, retirement communities, or any public space where elders or their caregivers may frequent. The more visible the knowledge about reporting is, the more likely people are going to report the abuse they see. Prominently display the abuse hotline numbers and information online through state agencies. The abuse hotline numbers and information should be a part of every public service or government website, especially any site on which people can find information about government programs that assist elders and their families. It should also be prominent and on any website where consumers can obtain information about or apply for food stamps, Medicaid, community services, Medicare, etc. These numbers should be displayed in a prominent color and font and include a button that will lead consumers to a page with more information about elder maltreatment. For sites that serve the elderly, put the abuse hotline number at the top of each page in a banner ad or on the right side in a column style ad. The maltreatment of our elders is already significantly under-reported. Under-reporting leads to unstopped harm and increased costs to communities. While there are many reasons that contribute to under-reporting, states must do all they can to ensure they are not creating barriers that make reporting more difficult. By taking these five steps, states can remove many of the barriers to reporting and let their citizens know they are serious about stopping the harm to elders.